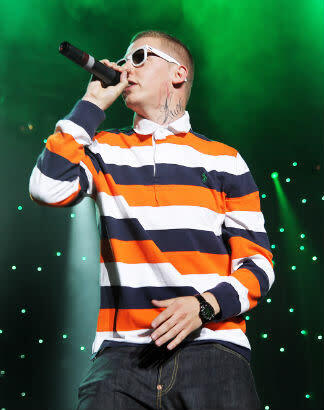 Professor Green is back! The rapper has unveiled the video for his new single 'At Your Inconvenience'. The video, which can be watched below, includes a host of very random objects from a clown to an ostrich – worth a watch just for that. Throughout the track Green takes no prisoners as he mocks a host of celebrities including footballers Wayne Rooney, John Terry and Wayne Bridge, and TV presenter Caroline Flack and tennis star Anna Kournikova. Professor Green is currently recording material for his second album, 'At Your Inconvenience', which will be released later this year. The first single from the album has been confirmed as 'Read All About It' and is scheduled for release on 24th October. Simon Cowell Wants Cheryl Cole To Replace Tulisa On X Factor?